Korean companies have $4 billions worth contracts in Libya, GECOL says - The Maghreb Times ! The CEO of the General Electricity Company of Libya (GECOL) Ali Sasi said the South Korean companies’ contracts with the stations of Al-Srir, West Tripoli, and Zueitina, are worth $4 billion dollars. This statement came in a presser for Sasi with the member of the Presidential Council Ahmed Mitig on Wednesday, and S.Korean ambassador in Libya, Kim Young-Chae, as well as representatives from the company that has contracts with GECOL in electric power fields. The Korean delegation – from the relevant companies working in Libya – arrived in Tripoli on Wednesday to discuss resumption of work. “This resumption will help overcome the crisis of power outages and lead to a sharp drop in load shedding hours.” GECOL’s CEO added, saying there will be a work plan for the Korean delegation in the two coming days to resume the suspended projects. PC member, Mitig, welcomed, the return of the S.Korean companies hailing the efforts of the UN-proposed government in contacting S.Korean officials to coax the companies into coming back to Libya. 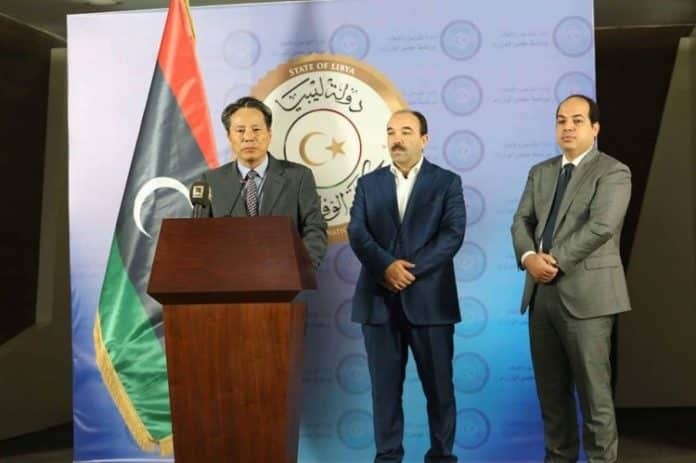 While S.Korean ambassador, Young-Chae expressed thanks for Libyan authorities and said Libya will overcome obstacles and regain stability soon, saying the companies are ready to resume work in Libya to resolve electricity outages.